As the eviction of Migron comes closer, an e-mail sent to department heads at the Defense Ministry reveals planned massive evictions. 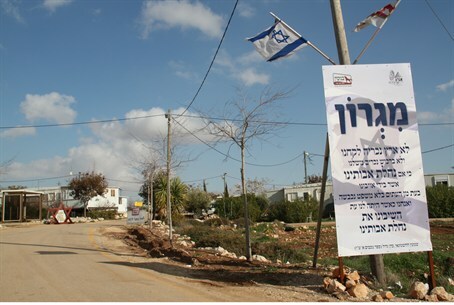 The Defense Ministry is planning for massive evictions of outposts in Judea and Samaria, including Migron, according to an e-mail distributed to department heads at the Ministry of Defense and received by Arutz Sheva on Friday. It goes on to ask the department heads to put together lists of employees who want to volunteer to take part in the evictions and send these lists to the department in charge of the eviction operation. The e-mail was signed by a senior official at the Ministry of Defense’s Human Resources Unit Department. The e-mail said that the schedule and exact details and times of the evictions will be sent in a future communication. It comes just several days before the Supreme Court of Israel is set to decide the fate of 300 Jews living in Migron, a thriving community just 14 kilometers north of Jerusalem. Residents living in Migron expressed anger at Prime Minister Binyamin Netanyahu’s failure to intervene as they appeal the pending destruction of their homes. The residents accused Netanyahu of abandoning them to the whims of the State Attorney’s Office. They were angered by warnings that if they fight their eviction, they may not get alternative homes. Earlier this week, the left-leaning State Attorney's Office and Attorney General's Office defeated Israel's elected leaders in the matter of Migron. The two announced that the State’s response to the Supreme Court motion filed by residents of Migron will determine that they must be evicted from their land. This recommendation was made despite the fact that residents have recently purchased the land that their homes stand upon and despite the fact that the Ministerial Committee on Settlement Affairs chose to stand behind Migron’s residents.